A team of first and second year MBA students from Harvard Business School (HBS) visited Cape Town in early January as part of their Immersion Experience Program (IXP). This programme allows MBA students to be exposed to different business cultures and environments all around the world. 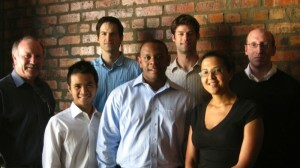 Pictured: Kit Vaughan (CapeRay), Viet Huynh (HBS), Roland Baasch (CapeRay), Rashaan Campbell (HBS), Adam Burgh (HBS), Tania Douglas (CapeRay) and David Kiren (HBS). Facilitated by the Silicon Cape initiative, CapeRay Medical was selected from among ten up-and-coming Cape Town companies to participate in IXP 2011. A group of four students spent two days working with CapeRay to develop an export marketing plan and then came together at the Fire & Ice Hotel where the companies, students and potential investors shared their findings. The students were able to learn about CapeRayʼs business model and were optimistic about the future of dual-modality breast imaging in solving the problem of detecting breast cancer with high sensitivity.